This essay is written in order to summarise a five year project on the Sefer Yetzirah, and to serve as an account of some of the main experiences resulting from working with the text and commentary on some of the problems. The Sefer Yetzirah is an ancient Hebrew text which contains astrological ideas, sacred geometry, angel work, letter mysticism and a description of the moral order of the Universe. The exact date of its origination is clouded by mystery but it seems to draw influences from Greek, Persian and Egyptian thought. The purpose of the text is equally mysterious, some say it is a exegesis on Kabalistic theory, others practical instructions on the making of a “golem” which is purported to be a kind of android or artificial intelligence. Our group both studied and worked with the text, that is followed the practical instructions which are contained therein.. This essay is divided into several chapters but these chapters are nt meant to refer directly to the chapters of the Gra Version of the Sefer Yetzirah. Chapter 1 discusses the beginning of the project which involved transliteration of the letters forming the names of the Archangels, and the summoning of them (which is based on ideas found at the end of the Chapter 1 in the Sefer Yetzirah – Gra Version) and Chapter 2 is related to theoretical ideas arising from working with the Sefirot (ideas which are explored at the beginning of Chapter 11 in the Sefer Yetzirah – Gra Version). Chapter 3-5 of the essay follows Chapter 2-5 and is an account of the letter mysticism of the Sefer Yetzirah and focuses mainly on my own experiences of working with the letters and the angels and, in some cases, the experiences of other students. I also offer advice on some of the potential problems arising from working with the text, certain dangers and the sense behind the general advice that surrounds the text through the voices of the various commentators (such as the necessity of working in a group). I have chosen to focus on the actual experience of working with the text rather than the theories one can derive from it because there are more than enough books and commentaries detailing information on the theory. “He makes His angels of breaths, His ministers of flaming fire” (Psalms 104:4). The study of the Sefer Yetzirah began with a programme of summoning of the Archangels of the Sefirot, generally using the attribution system of Moses Maimonides. The students had no idea what to expect from these evocations, and most of them had very few preconceptions about what angels are.The Archangels were invoked/evoked by specific meditation on the letters of the name (e.g. Gabriel would be Gimel, Bet, Resh, Yod, Alef, and Lamed) through transliteration, superficial study of history and legends, mantras and visualization over the course of between a week and a month. It was this procedure and the incentive produced by its powerful effects that lead to the feeling that a deeper study of the individual letters themselves was necessary; this lead to Ch.2 of the letter study. I will now detail what I believe were the most important results/realizations of working with the Archangels of the Sefirot and then detail some of the particular qualities of each individual experience. The existence of the Archangels, in some form, was in no doubt after the study, but I do not believe that the study can lend more credence to any argument as to their nature – their being subjective or objective, mental constructs or celestial deities, psychological or universal forces. Whilst all Archangels seemed to communicate through a mixture of omens, emotions, thoughts, visions and dreams there was no empirical proof of their physical or psychic existences outside of the mind of the student. Similarly there can be no definite proof that all of these experiences were entirely stimulated and created by the excited mind of the student. Each Archangel that was studied had an entirely unique character which related differently to different students according to their own personality, i.e. some had a more positive experience of Gabriel than others, in the same way according to your own nature you will resonate with other natures in a unique way.The nature of the Archangel was determined by the letters that made up its name with the general suffix ‘iel’ meaning ‘of God’, ‘of Mighty One’.The two archangels that did not have the suffix “iel” in the Maimonidian attributions are Metatron and Sandalphon which are attributed to Keter and Malkuth respectively.The following is a list of the general feelings I received and the kind of experiences I had working with the archangels and in no way reflects the experience of the student body although in discussion it was agreed that the kind of experiences we were having were all based on the letters of the name of the Archangel in question. Gabriel – The focus of this Archangel seemed to be on traumatic memories, but not on any kind of healing process, but more on increasing awareness or knowledge of how one’s own trauma has affected the way one interacts with the world. This Archangel seemed to have a very clear and distinct “darkside”, and one felt as if one looked through the eyes of the angel and could literally see the darksides of other people. One seemed to focus on those aspects of the behavour in other people that was caused by their bad experiences in life that had left them bitter and alone – although not necessarily outwardly so. 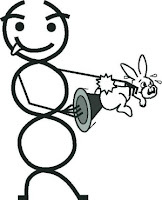 Communications also occurred through sychronicities and omens. The culmination of the study of this angel was recognition of my own submerged issues, by looking into others I brought my own self into focus, and saw how these issues affected the way I lead my life. It seemed that all people were engaged in psychodrama that expressed and explored their own issues, their own pain whether they were actively aware of this or not. I guess where the “strength” aspect of this angel comes in is that although people are often psychologically maimed, by grief and heartache, they carry on with their lives. As archangel of Yesod, Gabriel is associated with the Titan Atlas, who carries the world on his shoulders. Auriel – Auriel is the angel of the light of God who is said to guard the gateway into hell with a fiery sword – he is a slayer of demons par excellence. Working with this archangel was characterized by two factors a) a communication of the purpose or function of the Archangel delivered seemingly by the being itself in the form of flashing visions and b) specific information relating to the nature of Daat or Knowledge/Experience and how the orbital ratios of the planets, particularly Venus can be used to improve meditation on the ToL. Communication primarily took place through insight, or streaming seemingly channeled ideas; the angel was felt to be an external entity “planting seeds” in the mind. From walking and contemplating Auriel, the purpose was seen to be one of upholding the law and this was communicated through a vision of Auriel as “Shaft” from the popular US TV series. Thecommunication regarding Daat and the orbital ratios led to a meditation on rotating Sefirot, rotating according to their planetary attributions (i.e. one year = one day for Venus) and these lead into an “experience” or vision of Daat which was somehow related to parallel universes and shadow selves. Raphael/Michael – Since Raphael and Michael are alternately attributed between the Sun and Mercury in multiple sources and since it was impossible to tell which attributions seemed to be more fitting, the summoning of these Archangels was undertaken simultaneously. The communication from the Angels occurred primarily through waves of emotions and was concentrated via “conversation” with the Sun. uring these conversations I felt like I was shrinking, but alongside this was an intensification of my own importance, that no matter how small I was, and we are indeed very small compared to the Universe, that I was still and essential component in the Great Work of it. Again, in this case, the Angels seemed to be perceived as external rather than internal, that the experiences of mercy, forgiveness, healing and clearing of the soul were “beaming down” from the Sun and were indeed so powerful that I was reduced to tears many times during the course of this exercise. After the exhaustive weeping the angels delivered a sense of warmth and lightness, alongside a renewed sense of purpose. Haniel – Haniel was contacted by improvised shamanic ritual – dancing, singing and fire – based on the name. The angel seemed to generate a kind of “phantasmal light”, a supraluminescent glow, which communicated again through intense waves of emotion. The result of this was again, an intense and exhaustive weeping but rather than feeling “laid low”, the Angel offered practical advice in channeling and observing beauty through aesthetic appreciation. The Angel clearly suggested looking for beauty in obscure places like the motion of the scissors in a hairdressers hand or the skillfully manipulativeconversation of the salesman. The angel recognized an “enemy of culture” that seeks to devalue quality and of the personal power of discernment. Sandalphon – This was by far the uncanniest of the communications as when the Angel was summoned, one sensed a “real presence” standing directly behind one. It felt like you was being watched constantly but without a motive, a kind of impassive observation of the soul by an independent being. There was indeed a greater sense of this impassive observer standing behind all individuals but most importantly, standing withoutjudgment, and this lack of judgment communicated a sense of being imprisoned at the same time as feeling free. Metatron/Raziel – After this further summonings were attempted with Metatron, Iophiel and Raziel but one was overwhelmed by these experiences and I got very little of value excepting an insight via Raziel regarding the Tarot that lead me to abandon this discipline in favor of working purely with the Letters. It was, in fact, that communication from Raziel that really started me on the path of letter mysticism with a dedicated study of the Sefer Yetzirah. At this point the working with the Archangels was abjured as it was felt that a deeper revelation could be found through studying the individual letters of the Alef-Beit before attempting to combine them in to “Angels” which were essentially felt to be powerwords. 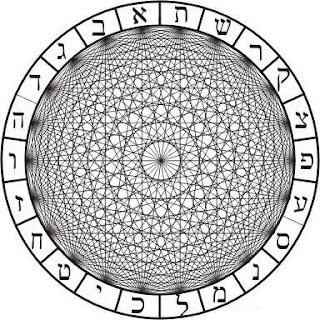 The Sefirot are referred to as “Ten Sefirot Belimah”, the word Belimah being a word which is often inferred (within this context) as meaning “nothingness” so the verse reads “Ten Sefirot of Nothingness” , which are derived from Nothingness (or No End, En Sof) as the modes through which God (Elohim) acts in the world. An alternative interpretation of this phrase “Ten Sefirot Belimah” can mean Ten Sefirot “without anything” or rather “Ten Sefirot without consonants” implying the vowel sounds as opposed to the mothers, doubles and simples which are explicitly united withconsonants (after working with the SY I favour this second interpretation – you will see why later). In one particularly powerful verse we read about ten depths – “a depth of good and a depth of evil” and so on with a depth for all six spatial directions (NWSEand Up and Down) as well as the two temporal ones (Beginning and End). Meditation on this idea produces a profound sensation of being “inside” an infinite universe of possibility and freedom of movement in time, space and morality. It also yields a realization that a loose abstraction of morality, i.e. that you are good or bad as an absolute fact about you, fails the self in question, and it’s more of a case of “how good can you be?”, the answer of course being that “there is no end to your Good”. The greatest realization for me, building on this idea, is that human intelligence is better thought of as a depth, an emptiness, or rather a “capacity” for idea, for sensation, for action – as opposed to a list of information one has acquired and which one can regurgitate on cue, or a flair for logic or reason – and also an appreciation that all human life has thisdepth or capacity although it often lacks an awareness of the “depth within”. What room the mind has! The ten Sefirot are then conceived of as a system of opposites, of five polarities (up/down, north/west, good/evil, etc) which extend to infinity. 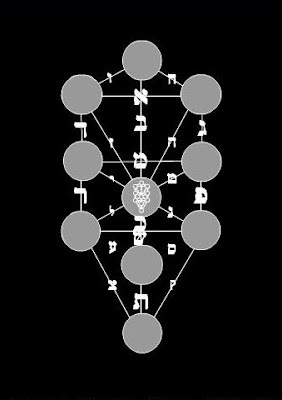 Out of these polarities emerge the structure of Etz Chaiim – The Tree of Life, which is a model ofinterconnectedness of the system of Sefirot via Hebrew letters. The specific letter attributions themselves are so much up for debate that the only important point to recognise at this point is that letters do connect to paths although exactly how so we willreturn to later at the end of this essay. For now we should just realize that the Sefirot areinterconnected and this interconnection leads from polarity to relativity. “Good” then, is connected to and defined by “Evil” as “East” is defined by “West”. 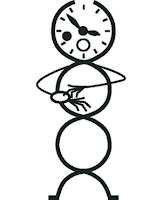 Long hours of meditation on this system leads to the construction of a “mental compass” and a significant development of the internal communication system of the mind; one, quite literally, builds neurological bridges in the mind, connections are made that weren’tthere before as in the development of any skill. From my own work on the theoretical structure of the Tree of Life, I would argue that my reflexes have quickenedalongside my thoughts, and my ideas are developed much more fluidly and fluently than they were before. There are numerous other changes I could cite, buthey, enough about me! “The end is in the beginning and the beginning is imbedded in the end” so reads Ch.1 v.7 of the Sefer Yetzirah. Via the Sefirot we have meditated on both the infinity of direction, spatial, temporal and moral, and the connection between those directions inthe sense of self – Am I in the north? Am I good? Am I young? We find that whatever direction we move towards extends into infinity and therefore the meeting point of all directions, moving outwards from the self, is infinity itself, En Sof or No End. Sincean equal amount of Good and an equal amount of Evil, or an equal amount of any pair of opposites are tantamount to 1 + -1 = 0 we find that the meeting point of all Sefirot moves towards the self is indeed nothingness – “Belimah”. Through extension andcontraction of the sense of self, towards infinity and towards nothingness we have identified a new polarity – infinity and zero which we combine into the conceptof the Sefirot. Each Sefira has the capacity of both infinity and zero. The Sefirot now, have been reduced to a singular form “Sefira” and it is with this concept of “Sefira” we have established our Foundation. Having established our Foundation and the intent behind the study of the letters, we continued with the Sefer Yetzirah. In this section of the commentary I will outline the instructions of the text and the interpretation of the theory behind them and then in the practical section I will list some of the results of working with them. The text reads “22 Letters of Foundation” and this was taken to mean the Letters “of Yesod”, which constitutes the first Sefira of Yetzirah and acts as the bridge between the real world and the world of imagination “Yetzirah.” Yesod is our Sefira of unification, outlined above, the place where physical combines with mental, where spiritual combines with material. The letters were to be seen as symbols of distinct types of spiritual/mental energy, force or kinesis relating to the 3 elements, the 7 planets and the 12 signs of the zodiac. Since Yesod, Yetzirah, is often considered as male (Zeir Anpin / Ben meaning Son) and Malkuth as female (Nuqba, fallen daughter) it was theorised that the letters were in fact vehicles of impregnation and the spiritual energy or force would find material manifestation. The text reads “stand them in a circle like a wall with 231 gates” and Aryeh Kaplan’s advice is to visualise each letter as infinitely big, a whole universe of that particular Yetziratic idea in its own right. The letters then were perceived as “stonehenge” like blocks standing around the circumference of our Sefira Yesod and interconnecting with each other and the centre of the circle via their own direct opposite. We, as students, imagined that we were in the centre of this circle and, facing Alef to begin with, rotated our visualisation through a depiction of infinite letters over a period of between a fortnight and a month per letter. I want to point out that times of meditation were not dictated by astrological concerns at this point of the study although in hindsight it is something I believe should probably have been considered. The duration of the study was more dictated by the exhaustion of the students with the analysis and visualisation of a particular letter. The text instructs the student to use various methods to obtain insight into the letters using verbs such as “carve, engrave, permute, weigh, probe, etc” Pottery and stonework were major influences behind the choice of these verbs but these material sciences must be applied in the spiritual world; hence the construction of an infinite letter in the mind means contemplating the desgin of the letter, making a mould of it within the imagination, filling this mould and then using the implement created to probe the imagination with. The substance that the letter is formed out of and which it hews into is the stuff of thought, which some understand as Logos, or raw meaning, and some see as Azoth or the astral light, it is however, our one substance acquired in Ch 1 and the substance of “sefira” (i.e. Yesod) itself. Two important considerations before continuing into the practical section of Ch 2 of the SY were the necessity of working in a group of students and under or with some kind of spiritual master. Firstly the importance of groupwork is down to validation of the experience through discussion which reduces the sense of madness (or losing touch with the self) and a deepening of the experience through the sharing of ideas and experiences. Secondly the importance of the spiritual master is to rescue the students when, as legend says, they ‚”sink into the earth up to the waist” – Since revelations within a study of this kind can be truly earth-shattering it is sensible to have a model of success to cling to and to aspire towards and the three main recommendations for this would be Trismegistus, Jesus and Elijah. Revelation: What is a Letter? Euphoria: The Power of a Letter! Trembling: The Dangers of a Letter! second they are in danger of becoming or feeling ugly and worthless. What was once an idea will become a reality, at least in the mind of the victim; Yetzirah, the world of imagination will become as of flesh, Assiah. seaside, where their contemplation of water would have been more “material”. say for sure whether I was witnessing the action of some outside force or was indeed “creating as I spoke” and this lack of certainty lead to the next two realizations the Euphoria and the Trembling. The Power of a Letter! between half a moon and one moon to complete. The Danger of a Letter! roped and anchored. I cannot attest my survival to any other factors. so doing 32 paths are now 1. Having sufficiently married the ideas of theory and practice of the Sefer Yetzirah in the mind of the reader, we will treat chapters 3 – 5 of the SY, i.e. the concept of Kingship only in practice. These chapters outline the “domain” of each letter or the principle that it governs in the manifest world of Assiah. In Ch. 2 the student was required to gain an understanding of the letter itself and although this was attained primarily in Yetzirah, the student could not help but notice some of the physical effects of the meditation in Assiah. Ch 3 – 5 are devoted to understanding the Kingship (Malkuth/Assiah) of each letter, or looking at how this Yetziratic idea finds manifestation in Assiah. Since one now knows the letters in Yetzirah, one is primarily concerned with the effects they generate in the material, be it through the action of “Yah” or the student, i.e. dependent upon whether you read the text in the 3rd person or the imperative. This section of the essay will focus on some of the general problems of the Kingships and then realizations specific to the mothers, doubles and simples accordingly. The main problem that I encountered at this point in the study is that there are several versions of the Sefer Yetzirah and each of them have different Kingships and associations with the letters and since I could not decide which version was the most authentic I resolved to simply study the Kingships themselves, and use the letter attributions of the Gra only loosely. “A pan of liability, a pan of merit and the tongue of decree that decides between them” or so the Mothers and their action is described. They are a symbol of the problems of decision making, balancing between two extreme forms of action and/or deciding between them, i.e. choosing between right and wrong, or to do something advantageous or disadvantageous and the point of neutrality which rests between them. Water and Fire, are the Kingships of Mem and Shin although it is difficult to say which one is more liable, and which one is more worthy of merit, as fire burns, but warms, and water cleanses but drowns, but they are useful to contrast as a pair of opposites and when fire meets water, steam is produced which as vapour is a useful metaphor for air. During the Ash/Fire Kingship I had a near fatal fall after meditating for a long time on a physical fire and maybe put this down to my own foolish over amplification of what is defined as an extreme energy (and typically Shin is associated with “liability”). If I was doing the working again, I would study the 3 Kingships in a group rather than individually and would urge later students to take my advice in this respect and focus on their interaction rather than the individual Kingships themselves. These were particularly difficult to relate to letters but essentially these kingships govern 7 aspects which dominate our perception of how our self relates to the external world, as opposed to the 12 Kingships of the simples which clearly relate to our own inner attributes.Governing such Kingships as Wisdom, Wealth, and Grace they can be used to induce phenomena or increase awareness of already existing phenomena associated with them depending whether you choose the imperative or the 3rd person interpretation.It was at this point in the study that the differences and arguably corruptions in the text began to make progression extremely difficult and again the general advice would be to study them in a group and then use the different associations from the different texts as an exercise in mind mapping and looking at a letter from a number of different perspectives. One could conceivably argue that these letters govern the group of kingships in the same way it is the combination of planetary influences in a person’s horoscope that governs the combination of life, wisdom, wealth, etc that the person will engage in life so they [the 7] are responsible for all 7 Kingships and the text alludes to this. For the study of the Kingships associated with the zodiac signs we decided to tie our study to the relevant zodiac sign beginning in April with Heh and Aries and sticking to the Gra version of the Kingship attribution.This was a much more powerful experience than the doubles or arguably the mothers and lasted a full zodiac year. There would be some of the Kingships that I would argue are inaccurate as they did not seem to match with the experience of the month and the meditation therefore jarred slightly but there were definitely some that were entirely appropriate.The general feeling after each Zodiac Kingship was an increased awareness of the faculty of sight, speech, or smell as an internal Kingship. By discerning “smell” from all possibilities of the senses, the fusion of the sense, and focusing a great deal of one’s mental energy on smelling for a whole month seemed to lead to a heightening of this sense and a deeper perception of what it means “to smell” to the soul of man. It was also as if from the head to the feet, the Zodiac man was opened up in the self, and one was more aware of the link between microcosm and macrocosm. If Chapters 1-5 of the Gra Version of the Sefer Yetzirah were intended to set up the theoretical system of the text then Ch.6 establishes some general rules about how it functions in the world of moral action. We will first look at summarizing some of the theoretical ideas behind our study and then look at how it changed the individual student. Partzufim are reconfigurations and personifications of kabalistic ideas to give them more meaning to the individual Kabalist. The Sefer Yetzirah can be seen, in many ways, as a process through which the 32 paths come to life, transforming from “dead letters” and symbols into living breathing icons and systems of and for consciousness to employ – Partzufim – thus there is not only a Partzuf of Beit developed in the sense that the symbol for Beit has become a storehouse for all that is meant by Beit, but as well it has become a mental tool which can “create” Beit, in the larger world. Beginning with 3 Partzufim before the study I finished with over 32 Partzufim and this number brings us back to the most intriguing Partzuf of them all – The Tree of Life. 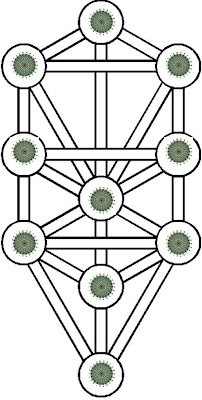 The Tree of Life is the ubiquitous sign of the Kabalah, the 10 interlocking Sefirot joined by specific Hebrew letters along lines called paths and although there are several popular tree designs few students understand this enigmatic idea and the processes involved in its construction beyond “rote learning”. Suffice to say the students began this study with a concept of the Tree but were already insecure as to exact path attribution to Hebrew letters this being down to the fact that I was aware of the different designs and through the study became aware of the different versions of the Sefer Yetzirah.In Ch 2, I showed how the 10 Sefirot are unified into 1 Sefira and I referred to this Sefira as our “Foundation”. In Ch 3 of this essay I explained how the students stood the letters in a circle around the edge of Yesod, whilst imagining they were in the centre of Yesod, and meditated on each in turn. Out of the 231 “gates” that join the letters to each other there are eleven spokes that pass directly through the centre, these join each letter with its opposite letter in the Alefbeit – i.e. Alef with Lamed. These 11 gates of “diameter” subtracted from the 231 gates leave us with 220 gates which act as chords to the circle, 220 being 22 x 10. The 11 gates that pass through the centre serve to unify the letters in the mind of the student. The letter one is facing and the letter one has one’s back to forming radii. The Partzuf of the 231 gates is an extremely powerful one. These 32 paths, now united, leave us with the nature of active existence, our Logos, or Azoth, and in turn we can look at the Kingships and how the specific letters have their action in Malkuth, the physical world. It is as if our Yesod of 231 gates is enclosed in a larger circle or sphere and if our system of gates are perceived as letter like stones, then the Kingship is the physical impression of the letter in the manifest world, as if someone were pressing an object into plasticine, as if the letter Alef, when used, leaves an Alef-like “footprint”. From the ToL then, we have derived “one name”, but now the ToL can be reconfigured with the understanding, the wisdom and the knowledge we have acquired through the study – we can literally undertake “Tikkun Ha Etz”. I had been intrigued by the Lurianic Tree with its division of the paths horizontal (3), vertical (7), and diagonal (12) to the mothers (3), doubles (7) and simples (12) – in fact in Ch. 6 of the Gra Version, a rule of 3, 7, and 12 is explained in a verse, alongside other information explaining how to rebuild a Tree and “be successful in creation”. It is outside of the scope of this account to go into all the reasons behind the Tree that I have reconstructed but I will say the following. My reconfigured Saadia Tree is based, approximately, on the Saadia Version of the SY which is one of the oldest and definitely the most poetically inspired version available (it can be found in the appendix of the Kaplan’s Gra version). I then attempted to formulate the simplest and most rational exposition of the principles of the SY in Tree format so I do adhere to the Lurianic path attribution system. The simples are assigned according to the astrological man with Aries at the top of the ToL and Pisces at the bottom (my arrangement being similar but not congruent with the Gra), and with the letters being divided between 6 severe letters and 6 merciful letters and placed on opposing sides of the ToL, the symmetry between the Yod and the Heh letters is reasonably clear.The other ToL Partzuf I have created as a result of the SY study is the Etz Shaarei – A ToL where each Sefira is like the Sefira used for the foundation of 231 gates. This format reveals how one can arrange the letters on the Tree according to whatever personal logic and interpretation one has perceived from studying the text and in many ways reflects a Tree of personal interpretation as opposed to a dogmatic memorization of one of the extant Trees. As stated at the beginning of this chapter, Ch 6 of the Gra Version is a discussion of the morality behind the SY, an exegesis which attempts to formulate practical rules for living and an explanation for how “Yah” works in the world – as well as instructions for constructing a Partzuf which expresses these rules like the Etz Shaarei or the Etz Saadia. The SY works with the metaphor of the King and I believe if one reads in the imperative, the King is meant to refer to the individual student and in this way the SY acts to empower the individuals while at the same time imbuing them with a sense of duty. The SY does not attempt to create a tyrannous ruler, but a philosopher King who values learning (Wisdom, Understanding and Knowledge) and reason (Beauty/Meaning), as extensions of the Foundation they have constructed and as a way of expressing that Kingship to the outside world. The SY returns to a simple description of the dimensions of space, time and observer (the moral dimension) and discusses how the King relates to them, i.e. on a throne, in his realm and in battle. In the same way that the SY does not shy away from transmitting a sense of power, it also does not shy away from conflict and confrontation, and its discussion of how the star signs interact is a description of some who hate and kill, and others who love and give life, and ultimately a description of a battle between good and evil. Finally the SY implies that only they who have undertaken this journey of self-discovery, only they who understand the polar nature of the universe, its unification and their Kingship within it, via “the middle path”, only they who have acquired the language of creation through struggle and self-discipline will be successful in that act of creation. with the seven [planets]He directed them with the twelve constellations. In conclusion, the SY is an extremely difficult book to work with because as Saadia Gaon said “many have been careless in transposing the text and there are many muddled version out there” and therefore there are many versions of the SY which disagree with each other in exactly what should be attributed to what. This provides us with two challenges and perhaps in the way we react to and explore those challenges two potential conclusions. Firstly we either accept the nature of language and specifically the language of creation as arbitrary and use the SY as a mechanism to free ourselves from dogma, release us into a truly individual mystical language, a kingship of personal expression and a fundamental liberty of idea – culminating in a realization similar to the Etz Shaarei; or secondly we see the SY as an ancient puzzle, a fusion of many disparate cultures, Hellenic, through Egyptian, to Ancient Babylonian, collected in this enigmatic Hebrew grimoire and take it upon ourselves to make sense of it – to form an individual “one true way”, a singular reason and purpose, “one name” that binds the mystery of the 32 paths, like the Etz Saadia.Perhaps we can see these seemingly opposing ideas as the opposing methods of the hemispheres of the brain, the first approach being that of the holistic creative brain, and the other as the left detail oriented separatist and logical. Perhaps in the same way we are equipped with both hemispheres we can endeavor to attain to both methods simultaneously and in so doing, avail ourselves of both freedom and reason, after all freedom and reason derive from “one name” which is Logos.